Rajasthan CSR Summit 2018 was hosted by Industries Department, Government of Rajasthan and co-hosted by NGOBOX, on 6th Feb, 2018. It was the largest CSR forum of the state. The aim of the Summit was to understand the possibilities of development through CSR in the state by bringing together companies, NGOs, Government, Social Enterprises and Advisory Firms to share and learn best practices and discuss opportunities for collaborations. 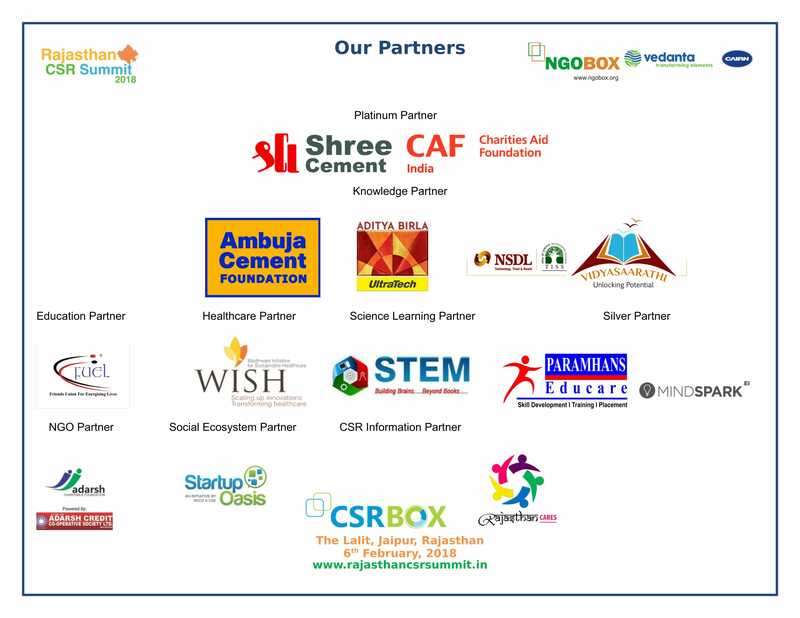 The Summit was co-sponsored by Vedanta Limited, Aditya Birla Group, Ambuja Cement Foundation, Shree Cement, Ultratech Cement, WISH Foundation, Adarsh Charitable Trust. 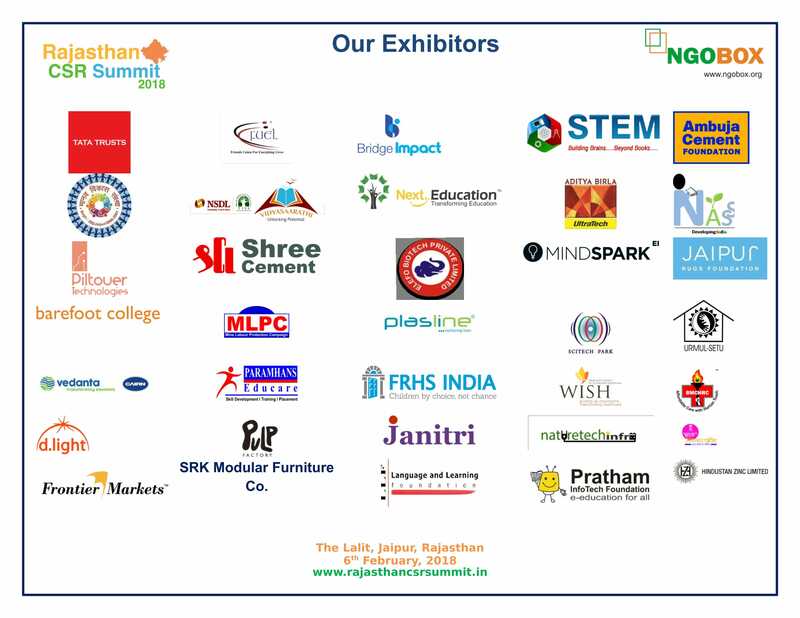 There were 675 delegates from 450 organizations, 130 + CSR Heads and 42 exhibitors. It was a platform which helped stakeholders to showcase their projects and programs; learn from peers; initiate new partnerships; find new resources; and in understanding how CSR is playing a vital role in developing the state. CSR in India has been observed to take many imperative turns at multiple levels of governance and policy making. With the advent of the New Companies Act, CSR has found a new meaning in Indian context. The participants and speakers in the conference were eminent names from government sector including Sh. Rajpal Singh Shekhawat, Honourable Minister, Industries, Government of Rajasthan being the chief guest, Mr. Kunji Lal Meena (IAS), Commissioner, Industries & Secretary, CSR, Government of Rajasthan, Mrs. Rajashree Birla, Chairperson, Aditya Birla Centre for Community Initiatives and Rural Development, Aditya Birla Group being the Guest of Honour and Dr. Yasmin Ali Haque, Country Representative India - UNICEF as special guest in the Summit. Experts from corporate sector and non-governmental sector were present at the summit, which provided their valuable inputs and innovative ideas in the field of CSR. The conference did highlight the extreme potential of CSR in the Rajasthan state that can bring about a paradigm shift in the development of state. The solutions on how maximum efficacy could be achieved through a holistic ecosystems approach, innovations and dynamism were brainstormed by the speakers and participants.